MARDUK - DARK ENDLESS 25 ANN. REISSUE (CD) | Online Shop | Wizard LTD. Album: "DARK ENDLESS 25 ANN. 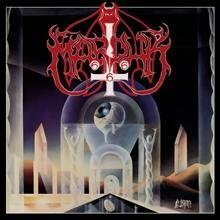 REISSUE (CD)"
The inclusion of Marduk’s debut album in Century Media’s Death Certificate series of reissues highlights the virulent strain of death metal that permeates the band’s roots. A pungent funereal ambience pervades throughout Dark Endless, adding an extra mean streak to their fearsome black metal attack. Marking the album’s twentieth anniversary, the latest incarnation restores instrumental opener ‘The Eye of the Funeral’ as a track in its own right (ominous discordant piano providing a menacing hint of the onslaught to come) and adds four live cuts from 1991 and two rehearsal recordings from 1990. Of the six real extras, only the live version of the magnificently titled ‘The Black Goat Of The Woods With A Thousand Young’ is of any interest to all but the die-hard fan, as all are lost to the kind of piss-poor audio quality associated with the nadir of the bootlegging scene.